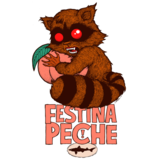 In Festina Peche, since the natural peach sugars are eaten by the yeast, the fruit complexity is woven into both the aroma and the taste of the beer. In addition to fermentation with an ale yeast, Berliner Weisse is traditionally fermented with lactic cultures to produce its acidic (or green apple-like) character. Served as an apertif or summertime quencher, Festina is delicately hopped and has a pale straw color. To soften the intense sourness, Berliner Weisse is traditionally served with a dash of essence of woodruff or raspberry syrup.